the tunnel itself is reasonably tight to the body. MRI (Magnetic Resonance Imaging) scanning is a medical imaging technique commonly used for brain, heart, cancer and muscle scans. The patient lies in a cylindrical machine which emits a powerful magnetic field. The body contains a high water particle content, with each particle containing two hydrogen ions. The magnetic field emitted causes these hydrogen ions, also known as protons, in the body to align in the direction of the field. Once the patient is within the machine, an electromagnetic field is briefly turned on. The energy particles (photons) emitted from this field cause the aligned protons in the body to have a shift in spin direction. Once the electromagnetic field is switched off, the protons gradually return to their normal direction and position. This return to the original spin releases the energy particles that they were supplied with. The released energy particle is then picked up by the scanner through an aerial placed near the area being scanned. The scanner sends this information through to a computer to produce an image of the area. Protons in different tissues return to their original spin at different rates, dependent on the water content of the tissue. For example, bones, which have low water content and therefore few protons, show up as a dark colour on the image, and fatty tissues, with high hydrogen contents show up much more brightly. This difference in colour on the image creates contrast which makes it easy to identify the tissues involved. Further to this, contrast agents may be injected into the patient to bring greater contrast for specific tissues, for example tumours or blood vessels. Alternating the frequency, intensity and duration of the electromagnetic field can be used to produce clear images of tissues surrounded by bone, for example images of the brain. MRI scanning of brain tumours is very effective as once a tumour has been identified it is possible to identify if the tumour has spread by looking for similar areas of contrast. Another great benefit of MRI scanning as opposed to earlier methods is that it allows images of the body to be formed without using harmful radiation such as X-rays. In fact, there are no side effects or dangers currently associated with MRI scanning, and it is not possible to feel the process occurring. The only potential side effects may result from a reaction to contrast dyes which are used on some occasions. A CT scan is most beneficial for observing bone structure, and is less useful for scanning soft tissues in the body. To scan these tissues more effectively, a doctor will usually suggest an MRI scan. 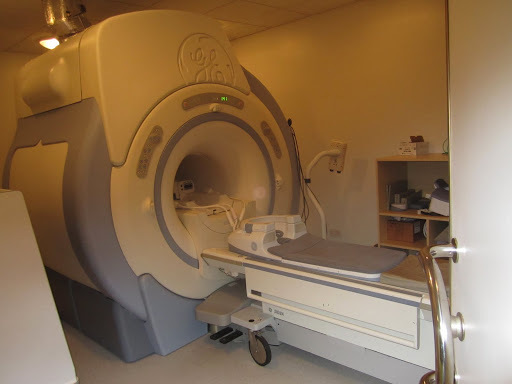 MRI stands for Magnetic Resonance Imagery. Rather than using radiation, this procedure exposes the body to a strong magnetic field, which affects the molecules in the body in such a way that a detailed picture can then be produced. 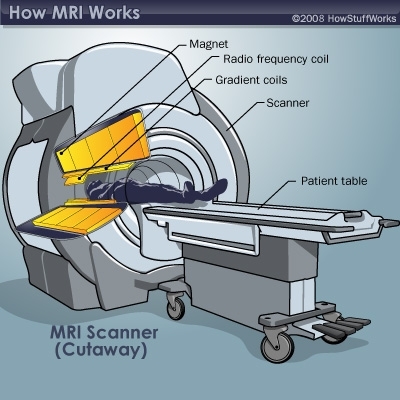 An MRI is performed in a similar way to a CT scan – the patient usually enters a cylindrical machine. However, an MRI scan tends to last longer, and can last up to 45 minutes. An MRI machine also makes a rather loud noise. In some cases, the patient will be injected with a dye, helping the technician to make the image even clearer. One of the major reasons for the increase in use of MRI scans is that they are far superior for collecting images for areas of the body apart from bone. They are also more versatile, and are used for help in diagnosing a wide variety of conditions. Another benefit to an MRI scan is that it does not expose either patient or technician to potentially harmful radiation. Although the length of time of exposure is relatively short, CT scans still have this risk; there are no known adverse affects to the patient from an MRI scan. The cost of an MRI scan tends to be higher than for a CT scan, although this can vary according to the patient’s needs. One reason why a patient might opt for CT is if they have metal implants in their body, since these often mean that an MRI is impossible. How Much Does a MRI Scan Cost in a Private Hospital? There are several differing methods of MRI scanning available in the UK both on the NHS and privately. When receiving a quote for MRI scanning patients are advised to ensure that this includes the surgeon’s fee, the consultant radiologist’s fee and the hospital charge for the procedure. Costs are the same whether an open or closed MRI scanner is being used, however there are several variables in terms of cost. These include the body part to be examined, the need for contrast/dye injection, whether the scan is to be performed at hospital or outpatient imaging centre and local competition in the region. Within London for example, especially at Harley Street clinics, the prices can rise considerably. Outpatient imaging centres usually quote a lower price for MRI scans, as opposed to hospitals. Special discounts on the cost of MRI scan can also be obtained in some instances and some centres or even hospitals may offer a discount payment is received in a single payment. A body scan performed under private healthcare generally starts at around £200 to £250 per region; these can include elbows, knees or the spine. Many clinics offer packages which allow for multi region scans which offer value for money on multiple scans. These prices are the same for a full abdominal scan. Brain scans are similarly priced to body scans, starting in the region of £200, and can rise to around £600 at a top Harley Street clinic in London. Prices begin to rise when the major organs are the area being scanned and a lung scan starts at around £300. Cardiac scans require far more detail and analysis and this is reflected in a sharp price increase; scans begin at £400 but can be up to £600 in Central London. The priciest scan available also carries the most convoluted procedure and as a result these tend to start at £550. Several clinics also provide an option for a full body scan which incorporates both CT and MRI scanning. These comprehensive procedures include an MRI scan of the brain and arteries to the brain, the abdomen, pelvis (including prostate for male and uterus and ovaries for female patients) and a CT heart and lungs scan. The cost usually starts at around £1300 but can be much more expensive depending upon the outcome of the scans which may provoke further scans or tests. Although MRI scans are widely available through the National Health Service there can be waiting times that vary from weeks to months. If you need a MRI scan quickly you can choose to have it done privately. Some private medical insurance policies will cover MRI scans so it is best to contact your insurer before booking a private appointment. There can be an insured cost of between £700 and 1500 for a scan carried out on any single part of the body. The price will depend on the area to be scanned with a heart scan costing around £400 while places such as Harley Street charge much more. This entry was posted in Magnetic field, Magnetic Resonance Imaging MRI, MRI. Bookmark the permalink.